During this past week, Central was occupied by thousands of demonstrators, as was Admiralty, Wanchai, Causeway Bay, and other parts of Hong Kong. The key question being asked is: What needs to be done to end the demonstrations? One of the two key demands of the leaders of the Occupy Central movement is that Hong Kong’s Chief Executive, Mr. Leung Chun Ying, resign immediately. The other major demand is for the Standing Committee of the National People’s Congress to reconsider its August 31 decision that only allows two to three candidates to stand for election in the 2017 chief executive election, all of whom would need to obtain the approval of 50% of the members of the nominating committee. The original plan of the Occupy Central movement was for about 10,000 persons to participate in a civil disobedience movement by occupying some sections of Central, which is the main business section of Hong Kong. Those persons presumed that they would be arrested for participating in what the government had announced would be an illegal activity. However, they were prepared to spend time in prison to demonstrate their commitment to bringing full democracy to Hong Kong. The present wide scale occupation was triggered by university students who decided to hold a demonstration near the government headquarters in the Admiralty section of Hong Kong. 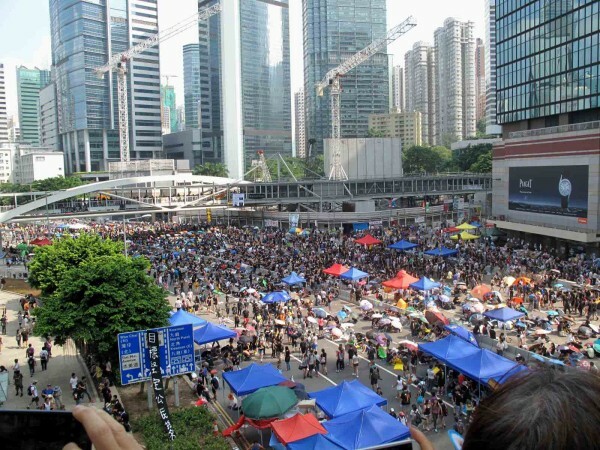 When it appeared that the government intended to arrest those who were occupying the area, tens of thousands of Hong Kong residents came out to support the students. Police officers had set up lines to prevent these supporters from reaching the area occupied by the students, but the supporters insisted that they be allowed through. These supporters first outflanked the outnumbered police officers, then occupied a long section of a 6 lane highway and eventually surrounded the police officers. Not long after this, the police shot tear gas canisters into the midst of the demonstrators, who quickly dispersed, but then returned as soon as the teargas had wafted away. This drama was repeated a number of times until the police eventually withdrew. The live coverage of events motivated many more residents to come to the scene to offer support. The demonstrators moved westward to Central and eastwards to the Wanchai area, where they also occupied the main roads. By the next day, other demonstrators had occupied roads in the Causeway Bay shopping area, as well as a main road junction on Nathan Road in the Mong Kok area of Kowloon. Hong Kong has a proud history of peaceful demonstrations and marches. However, this is the first time that such large areas of the city have been occupied for so long a period. Everyone has been impressed by how well behaved the demonstrators have been. On two nights, after work, I slowly strolled along the streets from Central to Wanchai. The mood of the mostly young persons was relaxed and almost festive. At some places, persons were shouting slogans, while at other sites speakers were taking turns analyzing the situation, but the majority of the demonstrators were sitting in small groups holding discussions. I watched how some persons were offering bottles of water to the demonstrators, others were handing out bananas, while still others were bringing bags of prepared food from fast food outlets and giving them to the demonstrators. Large black bags had been fastened along the railings into which people were placing their refuse, while other young persons were going around picking up the small amount of litter that remained on the streets. Some union drivers volunteered to use dump trucks to transport the accumulated garbage from the demonstration sites. The demonstrators have used police railings to build barricades at major intersections. Recently the demonstrators have agreed to open up lanes for emergency vehicles to pass through the demonstration sites that they occupy. On October 3rd, only a few demonstrators remained at the Causeway Bay site and the roads were again opened to traffic: in Mongkok there were attempts by trouble makers to create chaos at the demonstration site; in the evening, at a gathering of about 1,000 lawyers outside the High Court, another group of about five persons used a loud amplifier to try to drown out the speakers who were addressing the lawyers. Again, the key question: what needs to be done to end the Occupy Central demonstrations? This question can only be answered by looking at what triggered the decision to start the occupation, as well as the political-economic context in which the triggering event took place. Article 26 of the Basic Law states: “Permanent residents of the Hong Kong special administrative region shall have the right to vote and the right to stand for election in accordance with the law.” The pan-democratic groups in Hong Kong have insisted that the phrase “the right to stand for election” must be interpreted according to international standards. Government officials in Beijing have stated that there are no such international standards. However article 39 of the Basic Law has stated that the provisions of the International Covenant on Civil and Political Rights (“ICCPR”) remain in force in Hong Kong. In the announcement made by the Standing Committee of the National People’s Congress on 31 August 2014, the people of Hong Kong were informed that that there could be no more than 2 to 3 candidates and that in order to be a candidate a person would have to be nominated by 50% of the members of the nominating committee. The Basic Law does not set any limits on the number of candidates. Therefore, there is no legal basis for setting such limits. Further, given that the Nominating Committee is not truly representative of all the people in Hong Kong, potential candidates would be excluded during a pre-screening process. A related issue is whether the members of the nominating committee will both propose the names, and then decide which of those persons they will nominate, or whether the phrase, “in accordance with democratic procedures” would allow members of the public to propose names of potential candidates by means of some electoral process. Therefore, a basic question being asked by those supporting the Occupy Central movement is whether the decision made by the Standing Committee conforms to the Basic Law. The wider context of the current dispute is similar to the occupied movements that have taken place in other cities around the world: a key issue is the growing gap between the very rich and others in Hong Kong. The business tycoons are concerned that if a populist candidate is elected, their business interests, and particularly their profits, would be affected. Until about 25 years ago, the majority of workers in Hong Kong had to work seven days a week. When a bill that would give workers one day off each week was proposed, business leaders considered it as undermining Hong Kong’s economic foundations. In recent years, the same fears were expressed by business leaders when a minimum-wage law was proposed. Neither law has affected Hong Kong’s prosperity. Soon after the August 31 announcement by the Standing Committee, a group of happy business tycoons went to Beijing to thank the government for its decision. What needs to be done to end the demonstrations? A good constitutional lawyer would have little difficulty arguing that the decision of the Standing Committee is eminently appealable. AIthough Beijing has insisted that its position would not change, the above sentence in the editorial could be an indication that officials in Beijing would be open to reversing or amending the decision made by the Standing Committee on August 31. If so, political leaders, as well as representatives of those involved in the Occupy Central movement, together with leaders of the business community, can come together to try to agree on the conditions that would allow true universal suffrage 2017. The conditions would obviously have to include a provision that all persons who meet the criteria set out in the Basic Law, including those considered to be from the pan-democratic camp, can be nominated as candidates for the chief executive election in 2017. Article 45 refers to the methods for selecting the chief executive being specified “in light of the actual situation in the Hong Kong Special Administrative Region.” One way forward would be for the Hong Kong Government to inform the Standing Committee that the Chief Executive’s previous report did not accurately reflect the actual situation in Hong Kong. The Hong Kong Government could then send the new agreed conditions to the Standing Committee. To achieve that goal would mean that the business community would have to recognize that further economic growth in Hong Kong would mean sharing some of the profits of Hong Kong’s increasing prosperity with all the members of the community. On the other hand, if Beijing is not prepared to change its decision, force can still be used to clear the demonstrators from the streets of Hong Kong. It is also possible that the demonstrators may decide to withdraw from the streets in the near future. In either event the underlying issues will remain, if not on the streets, then in the hearts of all those who thirst for full democracy. To ensure the future stability and prosperity of Hong Kong, there needs to be a meaningful dialogue among all members of society about the best way to nominate candidates for the position of Chief Executive, and most importantly to ensure that no persons, or no category of persons, such as those from the pan-democratic camp, are excluded as candidates. * About AHRC: The Asian Human Rights Commission is a regional non-governmental organisation that monitors human rights in Asia, documents violations and advocates for justice and institutional reform to ensure the protection and promotion of these rights. The Hong Kong-based group was founded in 1984.